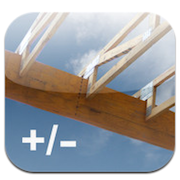 The Structural Wood Design Calculator is for the iPhone or iPod Touch. It is a tool for engineers, architects, and builders, as well as students to design wood beams for strength in bending, shear, deflection, and bearing. Also, a calculator for safe loads for wood columns is included. The beam design is calculated by inputting a few design parameters such as beam length, width and load. Also, only two wood design values are required, modulus of elasticity and Extreme Fiber. By keeping these two fields as input variables the calculator has the flexibility to study any wood species, custom site built beam, or engineered wood product. With these few inputs the calculator gives the results of the minimum beam height required, shear stress, bearing stress, and deflection. Supplemental results displayed by the calculator are section modulus required, moment of inertia, and allowable deflection.